The summer of major new features wraps up today with several new features that we’ve been excited about for years and are happy to finally deliver. Today is the last major push of the summer, so these will be the last of the new features, but we’ll have several small updates in the coming weeks that plug a few holes we know about and continue to solve problems as they come to our attention. Since the first major release of Eli, the “Assignment” was one of the system’s primary metaphors. The idea behind this choice was that offline assignments are often comprised of multiple pieces – with an essay, for example, an instructor might ask students to compose a thesis statement, followed by an outline, followed by a draft, followed by a revision. All of those things were considered deliverables (or “documents” or “writing products”) of the assignment – an assignment was a container for many potential pieces of writing. This was confusing for some students and teachers, though. You wanted a more streamlined approach.We listened! 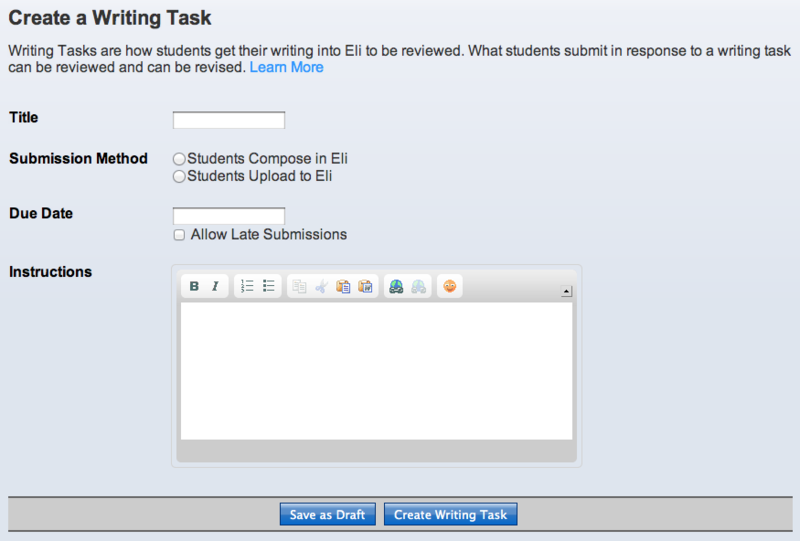 Now, the work students do in Eli comes down to three things:: writing tasks, review tasks, and revision tasks. We’re very happy to permanently replace the “Assignment” with the “Writing Task,” a much simpler interface. We alluded to the rollout of this new type of Eli activity with our previous big update, and you could see where we were going with the release of the revision plan feature, but now they’re officially here! Teachers ask students to do two types of revision tasks: 1) make revision plans and 2) revise and resubmit a piece of writing. Each type can be added at different times, so you can add a “revise and resubmit” task after students have completed a revision plan, but not vice versa (because yeah, planning a revision after you’ve written it makes no sense). 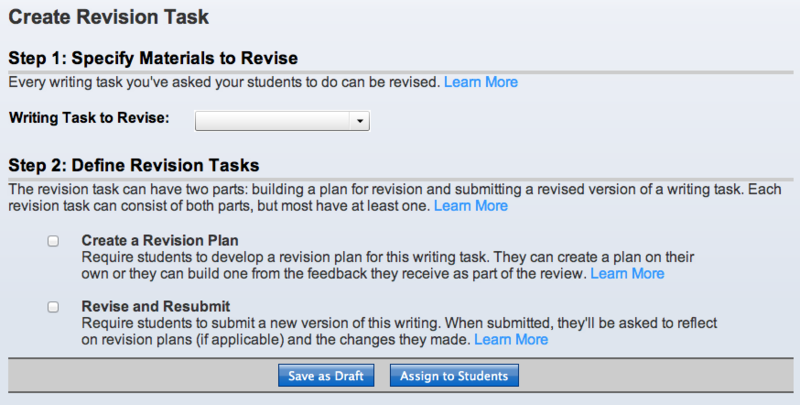 Students can make a revision plan without instructors assigning one. If an instructor does assign a revision plan, students complete it and then can elect to share it with the instructor. Teachers can leave feedback on the revision plan for a student to encourage any necessary changes before revising begins. Revise and resubmit tasks work exactly like writing tasks, but when students submit revisions, Eli records the revision as a new version of the original, making it easy to compare before and after. We’ll have a couple more revision features coming in the near future, but for now, we’re eager to get these into your hands and see how you’ll use them. Instructor’s Student Portfolio – instructors now have access to a course portfolio of each of their students. Unlike the Student Portfolio, the Course Portfolio collects all of the writing a student has done in that specific course, giving the instructor a history view of that student but not allowing them to see across all of that student’s courses. Being able to see writing, review, and revision task history across a single course or across an entire writing career should give both writers and teachers a distinct understanding of their performance. Adding co-instructors is a particularly powerful new feature. As co-instructors, they can create new tasks in your course, but they’ll also be able to re-use your tasks in their own courses. As always, we do a little housekeeping with each release, but this week there was only one: we fixed a bug that caused weird date range issues – courses could only last two weeks, assignments would come due at strange times, etc. Release Notes – Friday, August 24 was published to the Eli Review Blog in the category Release Notes.